Tabasco, originally uploaded by Lobstersquad. All through my childhood there was a bottle of Tabasco in the pantry. The same bottle, for years and years, like an old friend with a yellowing label. I don't consider myself a hot sauce fiend, of course, but somehow we've got through a bottle in the ten months we've been in Aberdeen. Mysteries of the frozen north. Posted by lobstersquad at 3:34 p. m.
I few years ago the new CEO of Tabasco made a deal with the company that if he double the production in 12 months, he would get a huge bonus. He had the bottle re-worked with larger holes in the top. What was 2 shakes on someone's eggs every morning turned into twice as much sauce on someone's eggs. So maybe that is why y'all have gone thru the bottle so quickly. 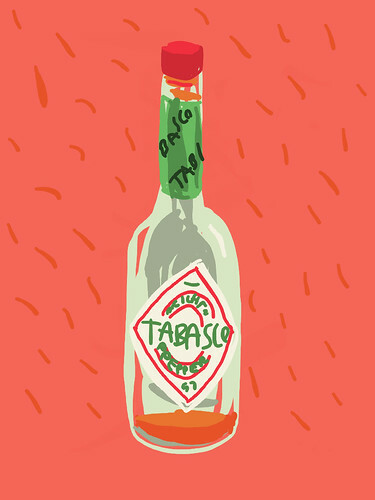 There's a very old joke about Tabasco - "My husband and I have been married for so long, that we're on to our second bottle of Tabasco!"